It’s got all the ingredients of a holiday hit: kids, Christmas, country music — and a special sauce: 20-million album-selling Grammy Award-winner Clint Black. The country superstar isn’t in the production but he helped create it. 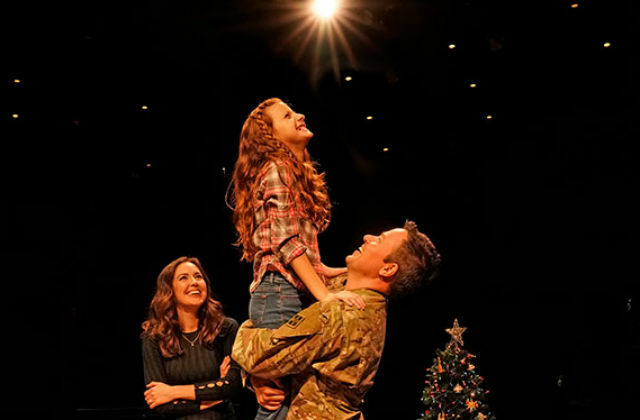 And yet, with all the right stuff, “Clint Black’s Looking for Christmas,” the good-natured, well-intentioned world premiere musical at The Old Globe, feels familiar and predictable. Most of the country/bluegrass-tinged songs were taken from Black’s 1995 holiday album that gave the show its name. He penned several new tunes just for the musical, and co-wrote the book with Broadway veteran James Sasser. Since Black sings solo story-songs, there’s a plethora of sorrowful or heartfelt ballads, and only a few group numbers. The lyrics are generally trite and cliché (e.g., have the pages all been turned, bridges all been burned; Santa’s busy this time of year; missin’ my family and countin’ the days). The creators claim no interest in taking the show to Broadway, which is a wise decision. But it’s a good fit for San Diego, since it focuses on a military family. Mike Randolf (sensitive, earnest Aaron C. Finley), an Army medic and staff sergeant, is still in Afghanistan in the first scene (the show is 90 minutes, with no intermission). On his final patrol, just before heading home for the holidays, his best friend is killed. When he returns to (some unnamed U.S. city), his wife (Liana Hunt, exuding warmth and concern) and 9 year-old daughter (spunky, precocious Kaylin Hedges), he shows all the signs of PTSD, including regularly seeing and speaking to his deceased buddy (a very solid DeLeon Dallas, who recently shone in the San Diego Rep’s “Actually”). He refuses to talk to his wife about his struggles. His daughter knows that he’s having a hard time, and thinks that dragging him to see Santa (isn’t a 9 year-old, steeped in texting, apps and Snapchat, a little old to still believe? ), and applaud her performance in the church Christmas pageant, will help. But Mike can’t handle crowds, confined spaces or loud noises. After his buddy’s widow (Syndee Winters, in an under-developed role) shows him a letter her husband had written, about honoring the sacrifice of others on a daily basis, he comes around, shows up to watch his daughter play a Wise Man (“Why can’t I be a Wise Woman?,” she astutely asks), and he’s well on the way to healing, though he never opens up to his wife or agrees to see a VA counselor. The effect of war on a solider and his family is certainly a worthy subject, but most of this ground has already been trod, though admittedly, not in a country musical. There’s not much depth, complexity or conflict here — the requisites of any potent dramatic creation. While the men are robust and engaging, both dramatically and vocally, and the six kids are agile and adorable, the lead females, while sweet-voiced, aren’t vocal powerhouses like most of the best country singers and Broadway belters. The direction (Kent Nicholson) and choreography (Wendy Seyb) are pragmatic and serviceable, and the set pieces (Sean Fanning) are effectively moved on and off the arena stage by the cast. The six-person, multi-instrument orchestra adds a jolt of down-home energy. Although there isn’t strong character development, there are efforts to help topicalize the piece and add a dash of humor: dependence on smartphones and ugly Christmas sweaters. On the more serious side, there are reminders of the Christmas story and the meaning of Christmas (“it’s what’s behind the gifts that counts”). And in a diversity-oriented effort, there are several remarks that not everyone celebrates Christmas. Despite the dark undertone of Mike’s difficulty with flashbacks and re-entry, this is a family show — all about family, friendship, faith, trust and even miracles, ancient and modern. It’s a pleasant diversion for and about the season, and a testament to the power of love. Performances are Tuesday, Wednesday and Sunday at 7 p.m.; Thursday, Friday and Saturday at 8 p.m.; matinees Saturday and Sunday at 2 p.m.. There will be a different schedule for December 19-31 (check online calendar). Additional matinee performances are set for 2 p.m. on Dec. 12, Dec. 21, Dec. 24, Dec. 27 and Dec. 31.